Bananas are the most popular fresh fruit in the United States, according to the Centers for Disease Control and Prevention. Because of their high potassium content, bananas are a fruit of choice among athletes, whose strenuous workouts can lead to dehydration and muscle cramps. Being low in potassium puts you at risk of that debilitating pain, commonly called a charley horse, but bananas are one choice of many that can keep muscle cramps at bay. Potassium is an essential mineral and electrolyte. Your body’s cells depend on your potassium levels being regulated to stay healthy, and potassium works with sodium to maintain your body’s water balance. But most people eat too much salt and too little potassium. It’s important to keep potassium and sodium in balance with each other. Potassium will protect you from the dangers of too much sodium. Your kidneys are the primary organ associated with maintaining potassium balance. A muscle cramp is the sudden and often involuntary contraction of one or more of your muscles. Muscle cramps can cause excruciating pain and temporarily make it impossible to use the affected muscle. Low potassium levels, called hypokalemia, can cause muscle cramping. You can suffer a potassium deficiency through strenuous workouts, severe diarrhea or vomiting, diabetes, taking diuretics and laxatives and eating too few calories. Low potassium also can lead to high blood pressure and irregular heartbeat. Athletes and people who take diuretics might need to supplement their potassium levels, but it is best to consume larger quantities of potassium-rich foods like bananas. 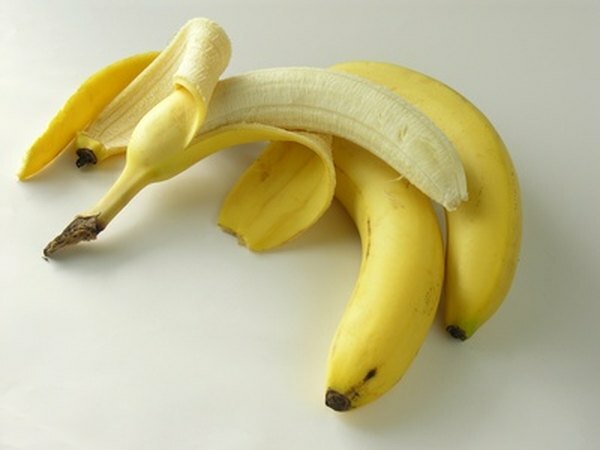 Many nutrition experts, like those at Colorado State University Extension and the Linus Pauling Institute at Oregon State University, recommend eating bananas to prevent, not treat, muscle cramps associated with low potassium. In addition, you should avoid getting dehydrated and thoroughly stretch after you engage in strenuous exercise. See your physician if you have chronic muscle pain. The recommended daily potassium intake is 4.7 g a day, but athletes and those on certain medications might need more. At 422 mg, one medium banana will provide you with a good dose of potassium toward your daily intake needs. A baked potato with skin, prunes, tomatoes, squash and spinach also are high in potassium.